My eldest favorite daughter (I also have a youngest favorite daughter) decided she wanted to make a rag quilt. They are shabby chic, typically created with muted colors, fringed all around and stitched with ragged edges showing on one side. The more they are washed, the more comfortable they become. For me, hooping layers for quilting is a challenge. It's nearly impossible to hoop two squares, with hundreds of fringed fingers, and batting together and keep everything aligned perfectly. 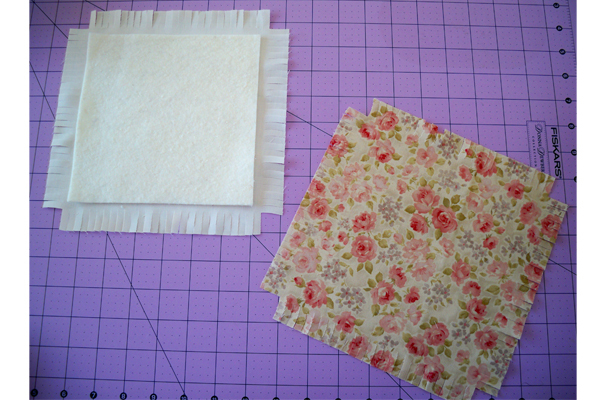 So I created a quilting framework, using cut-away stabilizer, to hold the blocks. 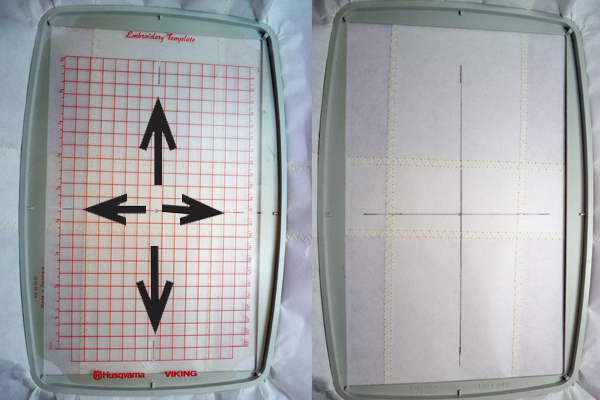 Using eight-inch wide cut-away stabilizer, cut two pieces 16 inches long and two pieces 12 inches long. I could have used cut-away large enough for the 5x7 hoop but purposely used a smaller size. Two pieces are needed in each direction. Perpendicular arrangement of the stabilizer framework further reduces the chances of stretching. 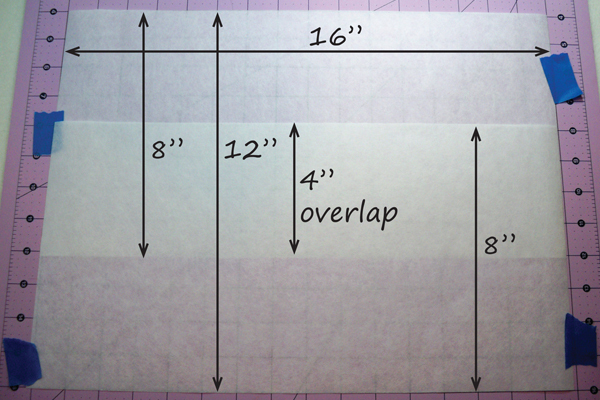 Lay the 16-inch pieces horizontally, so it measures 16" wide by 12" tall. 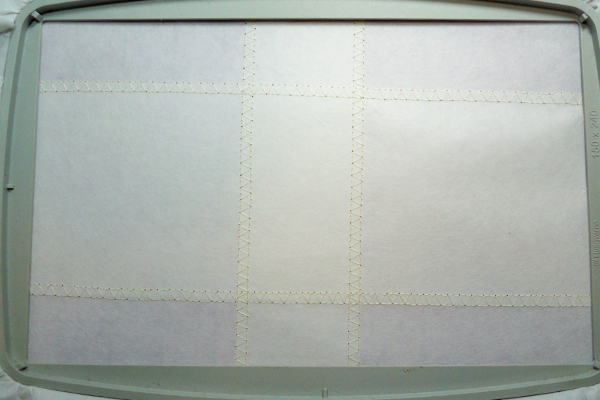 Apply temporary adhesive, or lapel stick, to the overlap areas to help keep them in place. 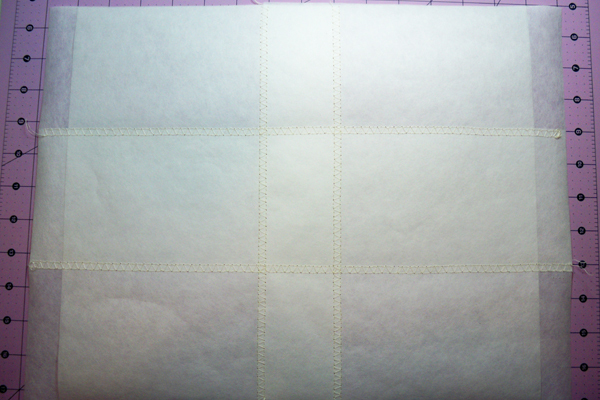 I also used painter's tape to secure the pieces to my cutting mat while arranging them. Lay the 12-inch pieces vertically on top of the 16-inch pieces, one inch from left and right so they overlap about 2 ¼”. Use adhesive spray or stick to help hold them in place. 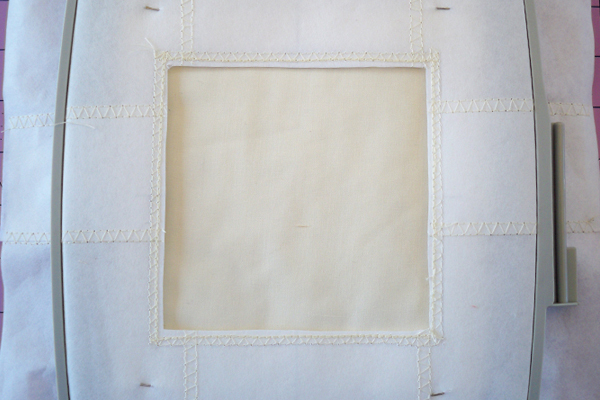 Use a flat seam utility stitch to secure each place where stabilizers overlap. The idea is to prevent any stretch in either direction so that, when the window is cut, it holds the layers for quilting in place without movement. Hoop the reinforced cut-away in a 5x7 hoop. Use your hoop template to mark the center dot and crosshairs. Draw intersecting center lines. 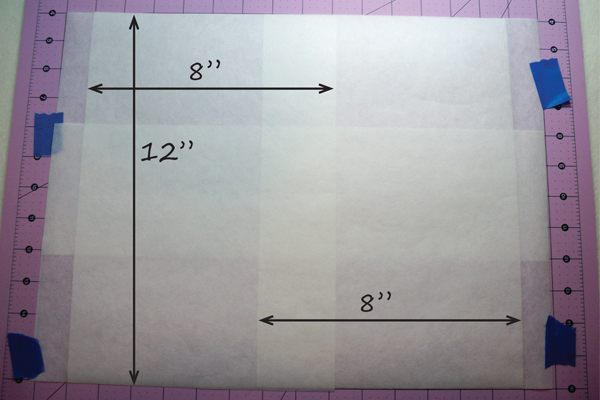 Measure a 4 ½” square from the center and another square 1/4" outside. Stitch the utility stitch in the area between the squares (see arrow), then stitch a triple stitch along the inside edge of the utility stitch to reinforce the window. Cut along the inside line to create the window. Lay a back square right side down. Spray a batting piece with temporary spray adhesive or basting spray on both sides. Finger-press it to the center of the back piece. Place the front square, right side up, on top of the batting, lining up edges. Finger-press to secure. Center the quilt block in the hoop. 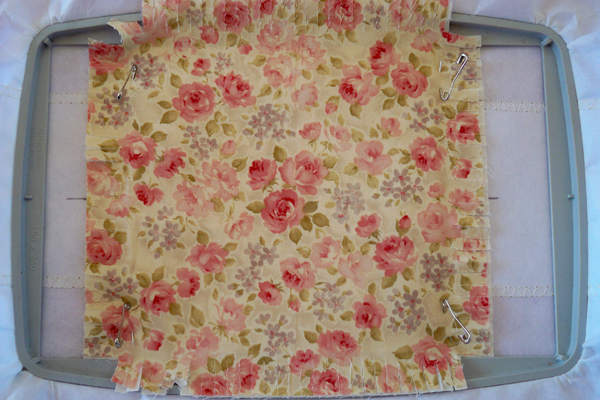 Pin four corners and sides to the stabilizer quilting frame. Curved safety pins work well and don’t need latched. The back window allows designs to be stitched through both layers of fabric and batting. 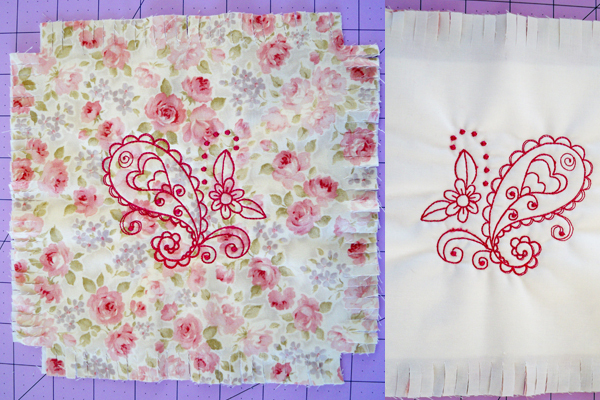 Designs were created for a 4x4 hoop but will be stitched in a 5x7 hoop. Depending on your software, you need to either save the designs for a 5x7 hoop or change the hoop size in your machine options screen. Otherwise, your machine will tell you the hoop is not correct. The designs stitch out beautifully and are much more attractive, on the front and back, than the standard "X" in the middle. Un-pin the block but leave the quilting framework in the hoop. 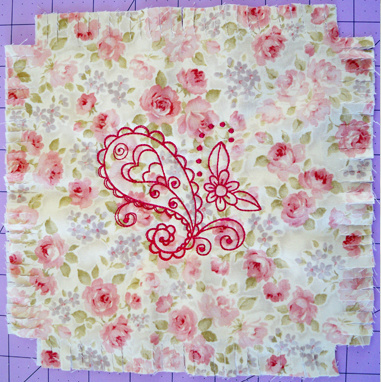 Pin the next block and continue stitching. You may need to re-hoop the stabilizer framework if it starts to sag. It's relatively easy as the hoop marks are already in the heavy cut-away stabilizer. 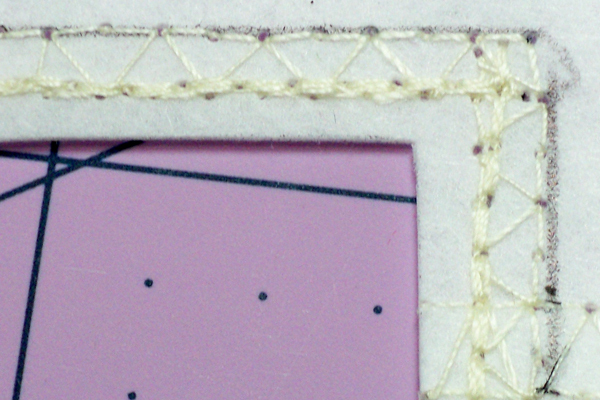 Just be sure the crosshairs are aligned with the centering marks in the hoop so the embroidery stitches centered in the square. More details and photos later as this project develops! SUPER BLOG! I don't do quilting but this is really great! That's quilting the easy way, anybody can do it!